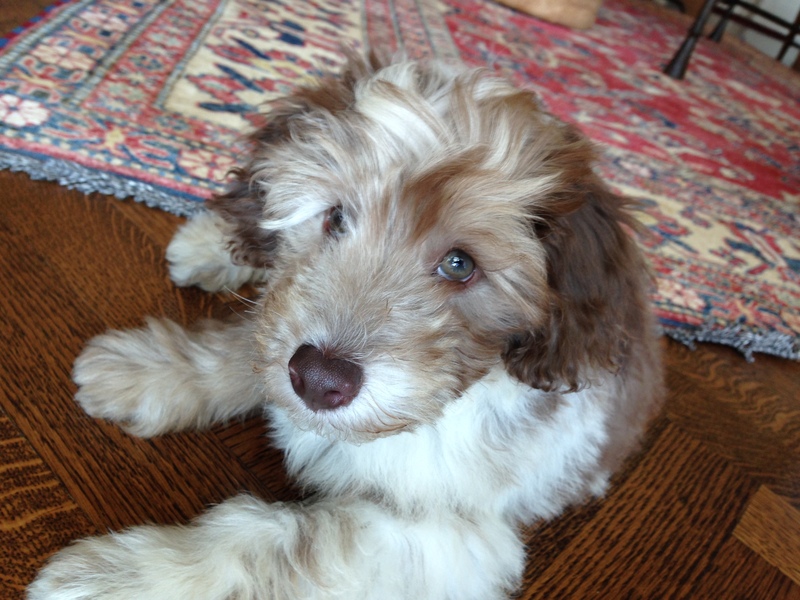 Bindi is a rambunctious 12 week old Mini AussieDoodle who likes to mouth and nip his guardian, jumps up, gets overexcited and only listens when he is inclined to do so. When I arrived for the session, Bindi was a little tired after playing with a neighbors dog so I chatted with his guardian about the last month of his imprint period and how she can use that time to socialize the dog expose it to things that will help it learns to be a well adjusted and confident dog. So many of my clients fail to take advantage of the 4th month of their puppies lives and that is time you simply can’t get back. many people think that a dog learns more about socialization and how to interact with other dogs and people in the first four months than the do for the rest of their life. The first two months of a dog’s life should be spent with their litter mates and mother. The third month of its life they are getting the shots that protect them so really it makes the fourth month one of the most important in terms of going your dog the experience and exposure to new things that leads to confidence as they mature. I suggested that his guardian sign him up for multiple dog socialization classes. Is one sufficient? I would hesitantly say yes. At this period in a dog’s life, the more positive exposure the better. I can assure you that the more dogs your puppy meets in this period (in a good and positive way), the better adjusted dog you will have. So if you have a puppy under four months or are planning on getting one, make sure you take the dog out and get it as much exposure to new things, animals and places as you can in its fourth month. As we were wrapping up this conversation, Bindi started to rouse himself from his slumber so I went through a simple recall exercise to help the pup start to associate obeying a command with a positive reinforcer; in this case a high value meat treat. At first it took a little coaxing, but eventually, big did Bindi get it. He started running off to his guardian or myself as soon as the other party finished giving him the treat for coming when called. AT first this is OK to reward as you want to make it abundantly clear tot he dog that coming to a human is rewarded. But once the dog figures out the basics, we need to help it understand that it needs to come when given the specific command word. To help him learn that the reward was given to reward him for following a given command, I had his guardian refrain from giving him a treat if he came running over without the recall command word. In cases like this, its difficult to not give in because of how cute the dog is or how funny it is to watch him slide on the floor (see video below) when he didn’t stop soon enough, but we have to be disciplined to help the dog develop some discipline of its own. Because he doesn’t have all of his shots yet, his guardian can’t really take the dog out to run around so I used the boundary of the living room to help her teach Bindi to walk next to her in a heel position. Now this is a challenge for any dog, but especially so for a 12 week old puppy full of energy. I attached a Martingale collar and showed his guardian how to apply the special twist of the leash to minimize the pulling, then I went over how to get the dog going when it tries to stop, how to reward it for walking in position and how to use the leash to communicate with the dog. For a 12 week old puppy, Bindi did pretty good. I did suggest that his guardian set up a fenced in area either on their porch or inside the house (preferably both) as she kept Bindi on a leash “pretty much all the time.” While I often use a leash to keep a puppy from going out of sight and getting into trouble, its important that it has some “me time” where it can run, jump and play as it wants without the encumbrance of a leash. Not only will this fenced in play area let the dog learn to play on his own, it will also help him developmentally. Many dogs get so strongly imprinted on their guardian that they develop Separation Anxiety. By giving Bindi his own area to play and be loose, he will start to develop a little independence and practice being on his own, albeit for short periods of time. Next I showed his guardian a Leadership Exercise I developed a few years ago to help the dog practice self restraint. This is not a natural instinct for dogs as they are generally reactive creatures to respond to movement and the actions of others. By helping the puppy develop this skill at such a young age, he will be much better prepared to control himself and listen to his guardian when she disagrees with him when he wants to do something he shouldn’t. It took his guardian a few repetitions before her timing and movement was up to snuff. Once it was Bindi started laying down to say that he understood he needed to wait for permission faster and faster. I suggested that his guardian practice this exercise a few times a day for the next 7-10 days to really develop his ability to self restrain. In addition to helping the dog learn some self control, the exercise also helps the guardian practice leading and correcting the dog. The more they practice this exercise over the next week or so, the better both will be in terms of interacting and communicating with one another. Another simple yet effective habit to get into is to have the dog literally follow the human. The more it does so, the more it identifies as a follower. Followers are more respectful and get into less trouble than dogs who think they are in charge of humans. A great place to practice this concept is when you let a dog in or out a door. This is an activity you will repeat tens of thousands of times over a dog’s life. Each time you ask the dog to wait, then reward it for doing so, you strengthen the leader follower dynamic that you want. By the end of the session, Bindi was following his guardian, not jumping up so much and adhering to her when she corrected him. It will take practice and a lot of patience, but since she has started teaching him these lessons so early, Bindi will be much better prepared to grow into a well behaved and balanced dog. If only all of my clients called when their dogs were this young!